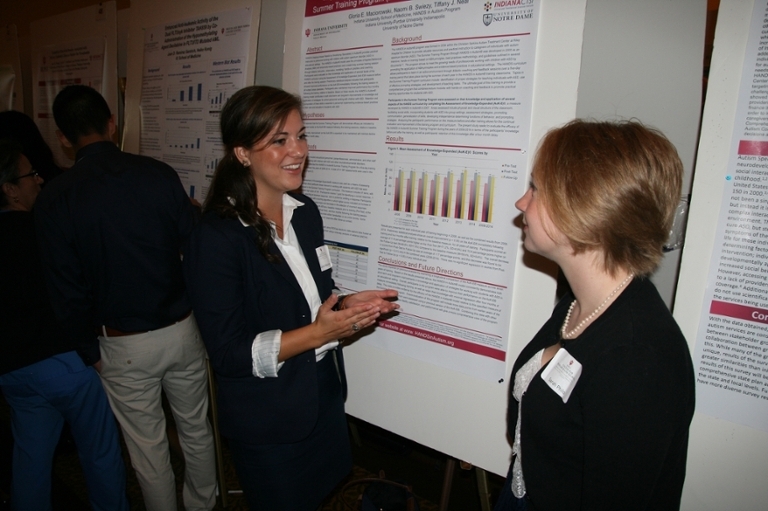 Over 100 students came to University Tower on July 26 to present their research to their peers and their faculty mentors. Participants represented all of the summer programs that the IUPUI Center for Research and Learning (CRL) sponsors—Undergraduate Research Opportunities Program, Multidisciplinary Undergraduate Research Institute, Diversity Scholars–Undergraduate Research Opportunities Program, and Indiana Clinical and Translational Sciences Institute, as well as the Louis Stokes Alliances for Minority Participation, NSF Research Experiences for Undergraduates, and others. Representing disciplines from political science to education to biomedical sciences and engineering, in all, 114 students presented posters or table exhibits. Participating students also took part in a scavenger hunt based on the abstracts submitted, which drew their attention to several highlighted presentations in each of the two sessions. At the event’s conclusion, from the forms submitted on which every answer was correct, Dr. Dominique Galli, CRL’s executive director, drew four winning entries for each session. The winning students, who each received a $20 guest CrimsonCard, for Poster Session A were Lionnel Nkurunziza, Isheka Orr, Pedro Sánchez Cisnero, and Siming Zou. For Poster Session B, Iyun Adebowale, Bea Aidoo, Connor Watkins, and Yuyu Zhang were the scavenger-hunt winners.